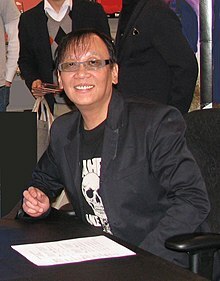 Yuji Horii (堀井 雄二, Horii Yūji) (also written as Yuuji Horii) (born January 6, 1954 in Awaji Island, Japan) is a Japanese video game designer and scenario writer best known as the creator of the Dragon Quest series of role-playing games, supervising and writing the scenario for Chrono Trigger, as well as the first visual novel adventure game Portopia Serial Murder Case. Horii graduated from Waseda University's Department of Literature. He also worked as a freelance writer for newspapers, comics, and magazines, including the Famicom Shinken video games column that ran in Weekly Shōnen Jump from 1985 to 1988. He then entered in an Enix-sponsored game programming contest, where he placed with Love Match Tennis, a tennis video game, motivating him to become a video game designer. Horii then created Portopia Serial Murder Case, a game that later inspired Hideo Kojima (of Metal Gear fame) to enter the video game industry. It is the first part of the Yuuji Horii Mysteries trilogy, along with its successors Okhotsk ni Kiyu: Hokkaido Rensa Satsujin [ja] (1984) and Karuizawa Yūkai Annai (1985). After creating several more visual novel adventure games, Horii went on to create Dragon Quest, which is said to have created the blueprint for Japanese console role-playing games, taking inspiration from Portopia, as well as Wizardry and Ultima. He was a fan of Apple PC role-playing games and was motivated to create Dragon Quest for ordinary gamers, who found such games difficult, and thus he worked on an intuitive control system, influenced by his work on Portopia. His works also include the Itadaki Street series. Horii was also a supervisor of the Super Nintendo Entertainment System game, Chrono Trigger, which had multiple game endings, with Horii appearing in one of the endings with the game development staff. Horii currently heads his own production company, Armor Project, a company that has an exclusive production contract with Square Enix, a contract established with Enix before the company merged with Square. He is currently working on Dragon Quest XI. He is on the selection committee for the annual Super Dash Novel Rookie of the Year Award. In 2009, Horii received a special award at Computer Entertainment Supplier's Association Developers Conference for his work on the Dragon Quest franchise. "Square Enix Co., Ltd. 2004 Annual Report" (PDF). Square Enix. 2004-03-31. p. 70. Retrieved 2006-09-18. ^ a b Nintendo Power November 2007. Future US, Inc. 2007. pp. 77–80. ^ a b Kasavin, Greg (2005-03-21). ""Everything is Possible": Inside the Minds of Gaming's Master Storytellers". GameSpot. CNET Networks. p. 2. Retrieved 2007-08-15. ^ Fujii, Daiji (2003). "Entrepreneurial Choices of Strategic Options in Japan's RPG Development" (PDF). p. 13. Archived from the original (PDF) on 2008-12-30. Retrieved 2006-08-12. ^ a b c "East and West, Warrior and Quest: A Dragon Quest Retrospective". 1UP.com. Retrieved July 5, 2011. ^ "Yuji Horii". Retro Gamer. Imagine Publishing (97): 72–73. 2011. ^ "Top 100 Game Creators of All Time". IGN. Archived from the original on March 5, 2009. Retrieved June 25, 2012.